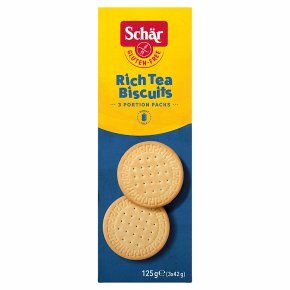 Gluten and wheat free Rich Tea Biscuits. Europe's no. 1 gluten free. Crunchy and ideal for dunking! Portion packed, snack on-the-go or pop in your bag for later. Wheat free. Suitable for vegetarians. Dietary product. Specifically formulated for people intolerant to gluten.